12/02/2013 Mary Comments Off on Dell’s Cyber Monday Deals!!! Cyber Monday Sale! 25% off Samsung 40-inch UN40EH5300 1080p 120CMR Smart LED HDTV for $397.99 only with free shipping! Cyber Monday Sale! Vizio 32-inch E320i-A0 E Series Smart Blacklit LED LCD HDTV – for $288 only and get extra $50 promo eGift Card + free shipping! Cyber Monday Sale! 37% off Dell UltraSharp U2413 24-inch 1080p widescreen IPS monitor – for $379.99 only with free shipping! Coupon code $PWG5126T786W? Starting on 11/27 at 6pm! Black Friday Doorbuster! 57% off Jarba Sport Corded Headset for $29.99 only with free shipping! Black Friday Doorbuster! 44% off Dell 1TB external portable hard drive for $49.99 only with free shipping! Black Friday Doorbuster! 38% off Dell Inspiron 660 desktop with 3rd Gen Intel Core i5 processor, 8GB memory, 1TB hard drive, and 22-inch Dell monitor for $549.99 only with free shipping! Black Friday Doorbuster! 33% off Dell Inspiron 15 laptop with 3rd Gen Intel Core i3 processor, 4GB memory, and 500GB hard drive for $299.99 only with free shipping! Black Friday Doorbuster! 45% off Canon PowerShot A2500 16MP digital camera for $59.99 only with free shipping! Black Friday Doorbuster! 47% off Nikon D3200 24.2MP Digital SLR camera bundle with 18-55 mm zoom lens, Nikkor 55-200 mm lens, and wireless adapter. For $499.99 only with free shipping! Black Friday Doorbuster! 39% off Dell Inspiron One 20 all-in-one desktop – for $349.99 only with free shipping! Black Friday Doorbuster! Dell Inspiron 11 3000 Series Touch laptop – for $299.99 only with free shipping! Black Friday Doorbuster! 50% off Dell E2313H 23-inch 1080p widescreen monitor – for $99.99 only with free shipping! Black Friday Doorbuster! $250 off Sharp 50″ LED 50LE442U Aquos 1080p 60Hz HDTV – for $498 only with free shipping! Black Friday Doorbuster! 33% off Dell Inspiron 660s slim tower desktop for $199.99 only with free shipping! Black Friday Doorbuster! 47% off Dell Inspiron 15 laptop for $199.99 only with free shipping! Black Friday Doorbuster! 33% off Xbox 360 4GB with Kinect holiday bundle – for $199.99 only with free shipping! Black Friday Sale! $30 off Xbox 360 4GB console for $179.99 with free shipping! Black Friday Doorbuster! Dell Venue 8 Android tablet with Intel Atom processor, 2GB memory, 16GB storage – for $129.99 only with free shipping! Dell Black Friday Sale – Save up to 53% off popular electronics and accessories – featuring Samsung, LG TV, Dell monitor, Xbox, and more! Dell Black Friday Sale – 4 rounds of limited quantity doorbusters! Save up to 47% off popular PCs, tablets, and electronics with free shipping! Black Friday Sale! $140 off Dell Inspiron 660s slim tower desktop with 3rd Gen Intel Core i3 processor, 4GB memory, and 1TB hard drive – for $379.99 only with free shipping! Black Friday Sale! 37% off Dell Inspiron 660 desktop with 3rd Gen Intel Core i5 processor, 8GB memory, and 1TB hard drive – for $449.99 only with free shipping! Black Friday Sale! Dell Venue 7 Android tablet for $149.99 only and get a 32GB Micro SD card for extra storage. Free shipping! Black Friday Sale! Dell Venue 8 Pro Windows 8.1 tablet for $299.99 only and get a tablet folio and 1-year accidental damage protection! Black Friday Sale! Dell Venue 11 Pro tablet with Windows 8.1 and full HD display for $499.99 only with 1-year accidental damage protection! Free shipping! Black Friday Sale! 42% off Dell S2240T 21.5-inch multi-touch 1080p widescreen monitor for $199.99 only with free shipping! Sending flowers to the people you care about during the holidays when you cannot be with them is one of the most special tokens you can do to show that you care and are thinking about them, and Love them! Send a beautiful arrangement today to someone special that can’t get to your house for Thanksgiving. I have to say that I really enjoy my shopping experience with Kohl’s department stores. They have a wide selection of products and a great return policy. If I order something online, they let me send it back, or even return it to my local store if I want to. It’s very convenient shopping to say the least. Extra 15% off All Ducky Dynasty merchandise with code DUCKFAN15 at Kohls.com! Extra 15% off Women’s apparel. Select styles. With code WOMENS15 at Kohls.com! 30-40% off Winter scarves. Select styles. 30-50% off Slippers. Select styles. $10 off when you spend $40 or more on toys with code DREAMTOYS at Kohls.com! 30-50% off Handbags. Select styles. 50% Off Gifts. Select styles. 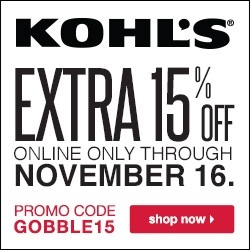 Take an Extra 15% off your order when you use your Kohl’s Charge card! Free Shipping with a Minimum Purchase of $75. Shop your FAVORITES right here at Kohls.com!!! 10/23/2013 Mary Comments Off on Get $$$ off the Silk’n SensEpil Hair Removal System! Get $300 off the Silk’n SensEpil! Use SENS300 at checkout. Here’s another great product from Silk’n that you may want to look at today as well ! !